We are delighted to invite you to this fabulous event, which is part of the Rivers of Carbon – Southern Biodiversity Linkages Project. Did you know that carp is the most commonly eaten freshwater fish around the world, and at Christmas is it is a special dish served in many European countries. While the rest of the world finds Australia’s hatred of carp difficult to understand, they have not seen the negative impact this fish has had on our waterways, making it difficult for our native fish to survive and thrive. 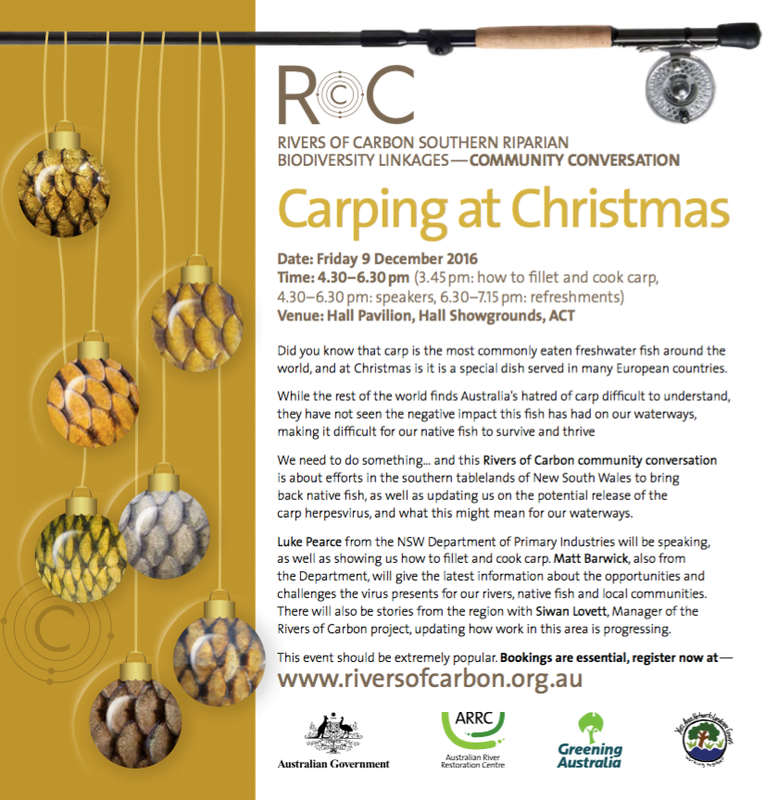 We need to do something… and this Rivers of Carbon community conversation is about efforts in the southern tablelands of New South Wales to bring back native fish, as well as updating us on the potential release of the carp herpes virus, and what this might mean for our waterways. Luke Pearce from the NSW Department of Primary Industries will be speaking, as well as showing us how to fillet and cook carp. Matt Barwick from the Fisheries Research and Development Corporation will give the latest information about the opportunities and challenges the virus presents for our rivers, native fish and local communities. There will also be stories from the Rivers of Carbon project, updating how work in this region is progressing. This event should be extremely popular project management online. Bookings are essential, register below. Here is a book of carp recipes – free to download! The proposed release of a carp herpesvirus has raised many questions from the public around how it will work, will it work and what will happen with all the dead carp. The Invasive Animals CRC has put together a terrific Frequently Asked Questions page, along with bite size videos where fishing celebrity Al McGlashan speaks to Matt Barwick from the NSW Department of Primary Industries to find out what the plans are to work to restore our waterways once the carp virus has been implemented. Follow this link to get the latest information about the carp herpesvirus.